Convents in Transition: What's Happening? As many communities of women religious hold and weigh tender questions about the future of their missions, they are also faced with the cost of eldercare and maintaining properties that are often larger than what they currently need. No transition of a congregation’s physical space comes without significant discernment, questions, challenges, and often a wide range of reactions by local community members. With trust growing, the Nuns & Nones conversations point to an historic opportunity to meet urgent needs of both groups—for affordable housing, sanctuary and gathering space, and communities of spirit and service—by halting the razing and selling of sisters' religious properties to the speculative market, through creative models of intergenerational partnership. Our research, in its very preliminary phase, hopes to explore what has been tried and considered, and to help spark creative conversations about alternative directions that might be considered through intergenerational partnership. As our research continues to unfold, in partnership with sisters, we'll update this website. For now, here's a brief glimpse into what we do know is happening, which we think helps illustrate to us the need and importance of this research. Many urban congregation’s sites have been sold for redevelopment and most often have been converted into either market-rate housing or offices. Some have been converted into arts and community centers or schools. 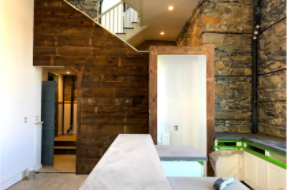 Often, interiors are gutted, while exteriors are preserved—since these are often valued or listed as historic sites—in order to be converted into luxury condos or “mixed use” developments, e.g. retail on the ground floor with coworking above. These are often controversial, multi-million-dollar projects that involve piecing together coalitions of stakeholders and local partners over years, and, not uncommonly, more than a few false starts, broken deals, complex politics, and pressure from local activists or preservationists. Unfortunately, some properties have been left vacant for some time, and also may contain inherent problems—like asbestos or mold—or may simply be in escalating real estate markets that make demolition and rebuilding seem more financially attractive than retrofitting. Many of these sites are demolished. Many rural sites—often retreat centers, cloistered communities, or formation sites—have adopted a practice of selling an easement to a conservation land trust. This is a compromise compared to a market-rate sale for redevelopment. While congregations usually take in less money from the sale by going this route, this decision is often made as an expression of values of care for the sacred spirit of the land, while still providing a one-time income and an ongoing tax credit that helps pay for expected healthcare and operational costs, and also maintains ownership of part of the property with key buildings on it. The above strategy is often combined with another for rural spaces that are, or are becoming, ecological centers and farms, such as Crown Point Ecology Center, Crystal Springs Center, and Genesis Farm, bringing in new partners, life, and connection to the community and the land. There are also many examples of monasteries, convents, and other sister spaces that have been converted into new missions in the Catholic Worker tradition, such as Su Casa in Chicago. We have already met and learned about sister sites that are made plans for transitions into facilities that offer elder care, care for folks with special needs or in medical transitions, or care for other groups in transition (such as women returning from prison or leaving abusive relationships). Some facilities have undergone expensive renovations to be prepared for their next planned use, and some are already welcoming folks to live together. A small volunteer team at Nuns & Nones has launched a research initiative in response to this question. Our goal is to uncover and elevate new ideas with sisters looking for creative direction beyond what either community could have imagined on our own, both to meet the urgent needs of community in our time, and to find ways to steward these spaces well into the future in ways that meet sisters’ financial needs and forwards their missions and charisms into a new chapter. Interested? Find out more about the research initiative and get involved as a thought partner!